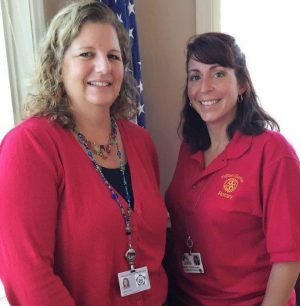 FULTON – At a recent Fulton Sunrise Rotary meeting, Rotarian Mary Costigan introduced Sarah Sunday, Aging Services Administrator, Oswego County Office of the Aging. Mary Costigan, right, and Sarah Sunday. She gave an informative overview of the services offered. OFA does a lot of education, sharing information, and making referrals for seniors and care companions in need of services. It manages the HEAP Program for persons over 60 and runs the Meal Delivery and Congregate Sites (sub-contracting to OCO, Inc.) throughout Oswego County. OFA provides home care and respite services, along with many other valuable services for seniors and caregivers. For more information, call 315-349-3484.